Informal intellectual collaboration is crucial for good social science research. This includes interactions with colleagues to improve a paper before it is sent to a journal. Our new research explored the value of informal intellectual collaboration. It highlights the importance of social networks in academia. What we uncovered suggests the scientific impact of a research paper increases with every additional commenter who provides feedback. This impact is measured by the number of citations over a paper’s lifespan. The same holds when we look at the probability of publishing a paper in top journals. But here’s the true novelty of our paper: it found that the feedback of more central or connected people is more valuable than less central, less connected ones when it comes to impact. And no, it’s not as simple as just asking your most senior colleague for their input. Seniority isn’t what matters. It’s all about how well connected an academic or researcher is. This is important information. Our results should encourage university management to actively encourage collaboration among scientists, across departments, and across universities – and to make networking and seeking feedback part of PhD training. So how do you define “well connected” in this case? A researcher is well connected in a social network because they are connected to other well-connected researchers. We used what might sound like a tautological idea in our research: the so-called eigenvector centrality, which posits that if you know important people you are probably important in that field, too. It is the same idea that allows Google’s search algorithm to identify relevant websites. But, as we’ve already pointed out, our findings weren’t about “importance”, or status. These eigenvector central academics are not necessarily the most well known or most senior. And they aren’t always affiliated to the most prestigious universities. Yet in the social network they occupy influential positions. It’s about connections. Think of them as opinion leaders. Feedback from eigenvector central academics has a much larger impact on a paper’s publication success than feedback from isolated loners. Highly connected commenters may point authors to emerging new topics or the most rewarding avenues for future research. To reach these conclusions, we built the first and most comprehensive view of the social network structure among financial economists. It connects authors and acknowledged commenters from published papers. This is a novel approach because it captures all those that have contributed to a paper, not only authors. Our innovative approach was to use acknowledgements as a primary source of data. In financial economics, authors often acknowledge from which colleagues they have received helpful feedback. We collected more than 5,800 research papers from six major financial economics journals. About 90% of these acknowledge helpful input by colleagues. After consolidation we create the network. Two researchers are connected when they have co-authored a paper or one acknowledges the other. 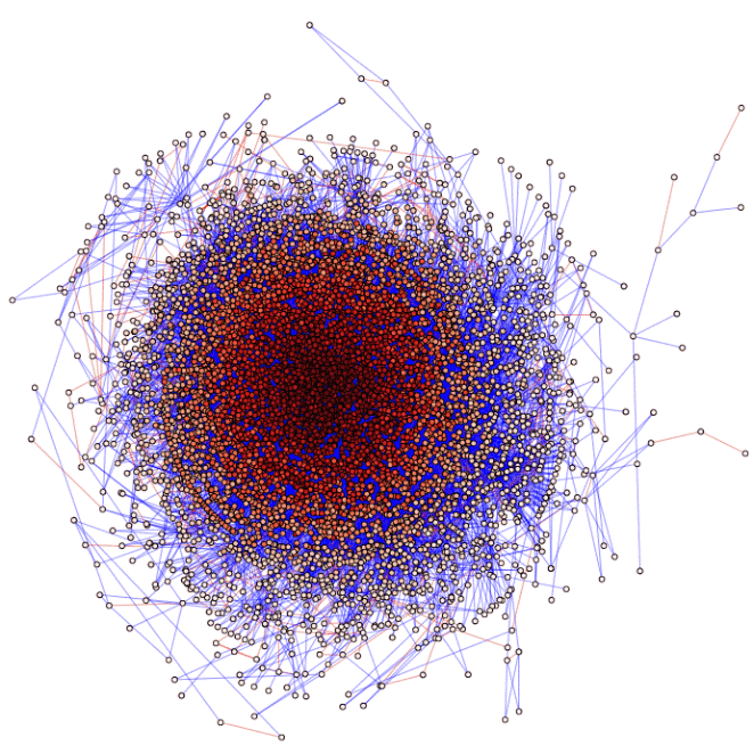 This network connects about 7,500 researchers and indicates information flows between them. Then we computed the network positions and ranked individuals according to their eigenvector centrality. Such an analysis helps uncover patterns and structures that remain hidden when looking at individual researchers only. We then used a quasi-natural experiment – the assignment of discussants at top conferences – to show our main argument: getting feedback from a colleague increases the scientific impact of a paper more if the colleague is more eigenvector central in the social network of their profession. On our website , we have developed an interactive tool where financial economists can find themselves on our database. In a companion paper we explore the determinants of the most eigenvector central financial economists. That is, we contrasted their eigenvector centrality rank with their individual characteristics. We found that traditional author metrics such as citation counts or their number of published papers cannot explain which researchers are eigenvector central. One part of the answer is certainly that citation counts have many problems and poorly capture true academic strength. Another one is that is generally difficult to identify the opinion leaders unless you know all the network. Our analysis is not exhaustive and research is ongoing. But it is clear that understanding knowledge flows helps in understanding productivity differentials among scientists. Hopefully these results will inspire university managers to actively encourage collaboration among scientists, across department and across universities. Our results also support calls to measure scientific impact broader , and not just based on citations. Finally, our findings highlight the importance of sufficient travel funding for academics, given the crucial role of academic conferences as a networking opportunity.